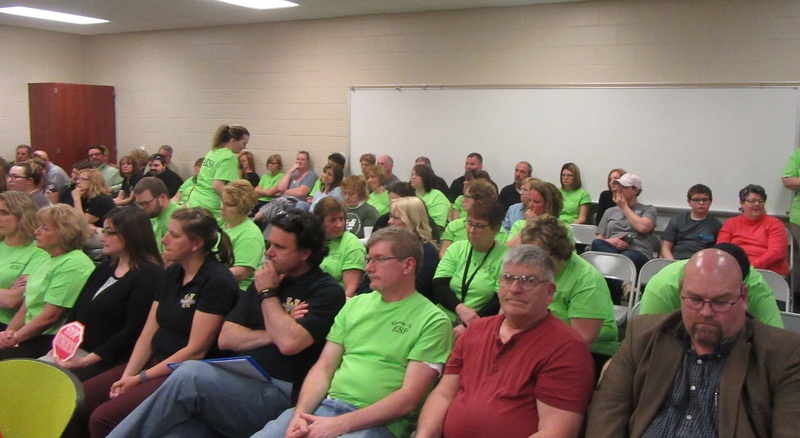 The Community Room at Wyalusing Elementary School was seated full for the April 9 public hearing over the potential outsourcing of maintenance services by the district. A much-anticipated public hearing about the potential outsourcing of maintenance in the Wyalusing Area School District on Monday night drew at least 80 concerned citizens and faculty members to the elementary school, where a public hearing was conducted as part of the regular monthly meeting of the school board. 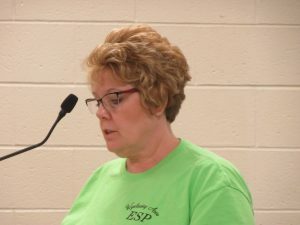 Most of those in attendance, many sporting green Wyalusing Area Educational Support Personnel (WAESP) shirts, also took part in a peaceful protest outside the school prior to the meeting. 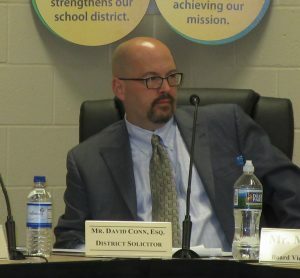 As a preface to the maintenance discussion, the district’s solicitor, David Conn (above), offered some basic guidelines as to how the hearing would be conducted and cautioned potential speakers that only the comments of those who properly identified themselves at the podium could be recorded by the stenographer seated beside them, an unusual sight at a school board meeting. District superintendent Dr. Jason Bottiglieri first offered an overview of the months leading up to the hearing, detailing the process by which the school board began exploring the possibility of contracting an outside company to manage maintenance. 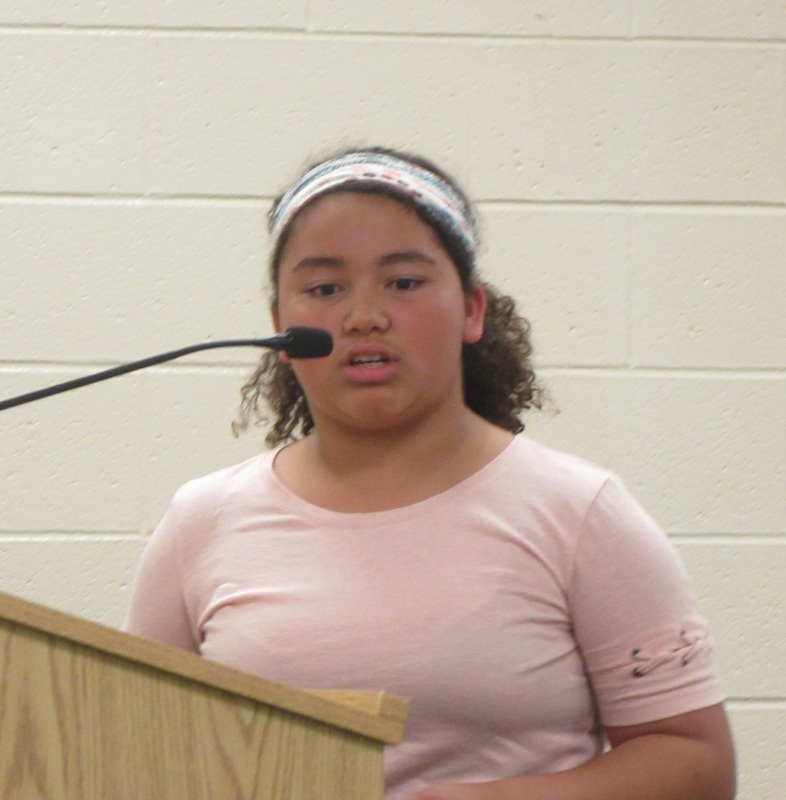 While the news of potential outsourcing may have caught some by surprise, he maintained that the district had followed proper protocol for each step, including advertising the hearings in the Rocket-Courier. The protests against the plans, including the Keep Strangers Out of Our Schools movement, had in fact begun well before last month’s meeting. Also detailed were the current costs to the school district for maintaining a custodial staff, which includes healthcare and retirement benefit packages for each. Salaries range from $46,000 to $89,000 per year. The total cost to the district is currently $684,303. From the five bids received and opened by the board on March 25, ATS Facility Services offered the lowest overall cost at $336,227. The next closest was Pro Quality Cleaning at $401,700. 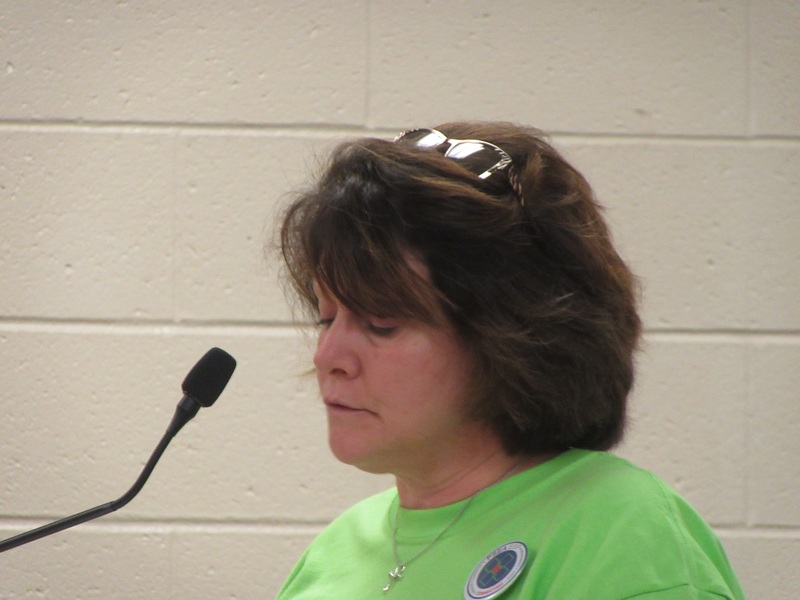 In addition to a projected savings of $375,657 by contracting with ATS in the 2019-20 school year, Bottiglieri noted that the board also reviewed each company’s policies for providing service and their treatment of employees, as well as their experience and credibility. ATS has a 32-year relationship with Cargill Corporation and provides custodial services at 150 sites in 22 states. The individual wages proposed by ATS, he added, surpass the U.S. Dept, of Labor median wage rates for the northern Pennsylvania non-metropolitan area. It is also the intention of ATS, Bottiglieri maintained, to retain the present staff or hire local replacements. Participants, who ranged from taxpayers and teachers to parents of students and current custodians, each voiced opposition to the plan. While their reasoning carried a common thread of not wanting the salaries and benefits of employees whom they consider “family” to decrease, the concerns expressed by a few were decidedly personal and poignant. “They earn a wage that allows them to live here. They are not rich,” said WAESP president Cheryl Chamberlin (above), adding that savings could be offset if employees are no longer committed to their jobs, which all of those who spoke insisted that they are. Third-grade teacher Jessica Mason maintained that the custodians go well beyond what their job descriptions might suggest, referring to them as a valuable safety net. When a number of students in one classroom become ill, custodians help to identify such clusters of illness, as well as communicable ailments like scabies, and take proactive measures to prevent their spread. Outsourcing “sounds good on paper” but has not worked for other school districts, she indicated. A general consensus by detractors of the plan, if it were to come to fruition, is that current custodians might initially accept employment from ATS due to a lack of immediate alternatives but would likely leave as they find jobs that match or exceed their current pay. Few believed that the company could possibly keep the present staff after dramatically reducing their salaries. “What are you going to do when nobody knows the facilities?” asked Jason Boatman of Herrick Township. “You might as well truck them down from the county jail on work release,” local resident Floyd Lent remarked. Others worried that the change would have unfair consequences for those closest to retirement and expecting a pension after their many years of service to the district. Custodian Chris Lent, a 33-year employee who noted that his work for the day was not yet completed, asserted that he will not work for another company before he left the room to finish his tasks. 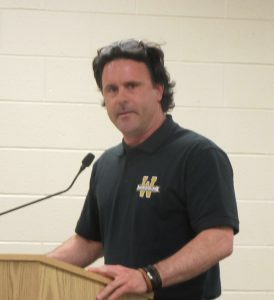 Previous outsourcing, consolidations and furloughs by the board over the years have been attributed to budget deficits, Kevin Deibert (above), president of the Wyalusing Area Teacher’s Association president noted. Why, he asked, is the school board seeking to outsource maintenance while reporting a fund balance of more than $1 million? Tom Dunn and Nick Vanderpool were among those who asked if the projected savings would result in a decrease in school taxes or the pay-off of some of the district’s outstanding debts. After all of those who desired to were given the opportunity to speak, Atty. Conn noted that the decision had been made to continue the hearing to next month, meaning that no vote would be taken by the board that evening. Though he had cited it as an option at the beginning of the meeting, some were taken aback by the announcement, seeing it as an underhanded move to avoid further confrontation. Board member Barb Prevost asked to address the crowd before the board moved on with the rest of the business on the agenda. While she related that she sincerely appreciated the comments of the speakers and especially their obvious concern for the welfare of the custodians and their relationship to staff and employees, she said that she took offense to the mailings conducted within the school district by those behind the Keep Strangers Out of Our Schools Movement. “I have no admiration for you,” she stated. 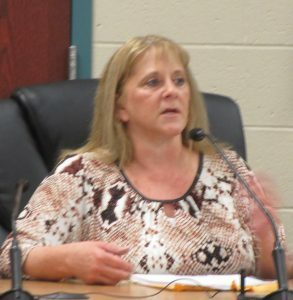 Prevost (above) also noted that she had spoken to a school board member in Tunkhannock who told her that their district had never outsourced maintenance, a fact that Deibert later confirmed. Lantz and board member Gene Anne Woodruff shared the experiences of parents of incoming kindergarten students with all Title instructors in a Kindergarten Readiness orientation workshop. Over the years, they noted, expectations of kindergarten students have evolved, and it has been found that many children coming into school lack basic motor and linguistic skills. Parents moved through a number of stations, where they were given supplies and instruction to help their youngsters with such fluency skills as rhyming. “They really enjoyed it,” Woodruff remarked, noting that some participating parents also won door prizes like gift bags and gift cards. Dr. Bottiglieri closed the meeting by inviting everybody back on Monday, May 13 at 6 pm for a State of the District address that will precede the regular 6:30 meeting.